We have the perfect combination of professional teachers, immersive cultural experiences and exhilarating adventures. Our teachers were educated in Medellín and worked at Spanish Schools in Medellín before founding Spanish Adventure. They have taught students from over 40 countries at all levels of Spanish. Immersion in the local culture is a key part to enhance your Spanish learning experience. San Carlos is known in Colombia for its many waterfalls and example of peace & reconciliation after the war. San Carlos is a hidden gem, and has yet to see international tourism. Learn more about San Carlos. We adventure and explore the nature of surrounding San Carlos, Antioquia daily. Including swimming in rivers, jumping off waterfalls, hiking and canyoning. Learn more about our Adventures. We pride ourselves in providing a 5 star experience. Don't just take our word for it! Over 100 5 Star reviews. Check out our reviews on Trip Advisor, Facebook or Google! 700.000 COP | Group Class, Accommodation, Lunches, Adventures, and more! 👎 Over 1.000.000 COP each week! Break away from the hustle and bustle of Medellín and spend time immersed in small town Colombia learning spanish. Located 40 miles (60 km) east of Medellín. 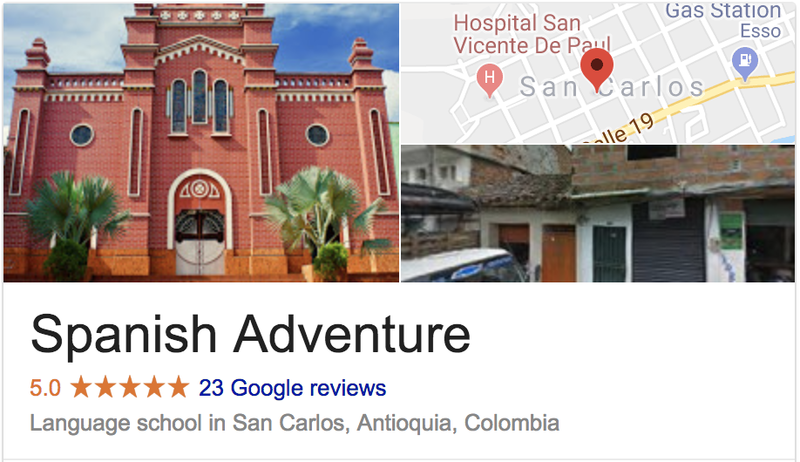 Spanish Adventure is owned and operated by Colombians. San Carlos is a small town with a unique history of reconciliation after the war. We have over 30 adventures and you can spend weeks and never do the same adventure twice. Our packages are a great deal and are perfect for solo travelers, couples or small groups. Join our alumni from over 40 countries who have gone on to backpack all throughout Central and South America. Read more on our blog! STREET SLANG - Learn to speak Spanish like a true Colombian!